#spon: I'm required to disclose a relationship between our site and Jimmy Dean. This could include Jimmy Dean providing us with content, product access, or other forms of payment. I personally think Surf and Turf is one of the best things ever! I can't get enough of it and when the folks at Jimmy Dean challenged me to use their Hearty Original Sausage Crumbles in a recipe, I knew right from the start I didn't want to do the obvious and go breakfast so I thought about some of my favorite recipes, and one of the ones that everyone asks me to make repeatedly, my 'Surf and Turf Stuffed Mushrooms' immediately came to mind! You can adjust the serving size to your preferences, but I find that 24 mushrooms work best (that would give six people four of them which works as an appetizer). 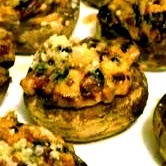 You can also use any kind of mushroom you prefer, I like the buttery flavor that the organic ones have, but I have also prepared this recipe with Portobello Mushrooms, and do enjoy them that way also! I tend to add more Garden Vegetables to my recipe, but garlic, onion and pepper are the basic ones I use. If I am using a spicy sausage I will also use finely minced celery in the recipe. 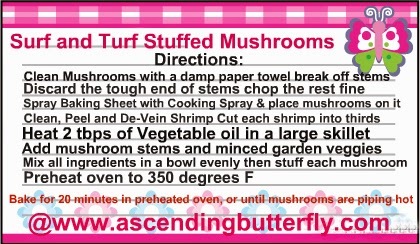 If you cut each shrimp into 'thirds' you should be able to stuff 24 mushrooms with a good ratio balance of shrimp to meat, but if you want thicker pieces add more shrimp to it, or cut each piece in half and not thirds. And while I didn't add it here, I also sometimes like to shred some sharp cheddar and mozarella cheese shaved thinly on top of each mushroom as I don't like adding cream cheese to mine. So feel free to play with the recipe to match it to your taste! If you are a spice fan, then feel free to substitute the hearty Original Sausage Crumbles with the Hot & Spicy instead. I find it easier to clean the mushrooms first before doing anything else, I hold the stems on the side and then prepare the baking sheet and add the mushrooms to it, then I go about dicing the stems. Then I prepare the Shrimp (of course if you can buy them already de-veined you save a step), I add the veggies and mushroom stems to the skillet and then I add the Sausage and Shrimp, you don't have to heat them too long because you will be heating everything together in the oven, it's easier to mix the skillet ingredients with the parmesan and breadcrumbs to stuff faster, but you can also just stuff them with the skillet items first, and then sprinkle the breadcrumbs/cheese mixture on top. I like the on top way if I'm using Panko, and the mixed way if I'm using regular breadcrumbs. But again that's to your taste! I have made a ton of variations on this recipe over the years, sometimes I will make it with crab and a spicier sausage (like a Chorizo or Andouille), sometimes shrimp, and I have even done these with Salmon as the Seafood component (a hearty white fish would work well too!). What I love about the Jimmy Dean Hearty Original Sausage Crumbles is that they save me a step as they are already in bite size pieces and they are fully cooked! 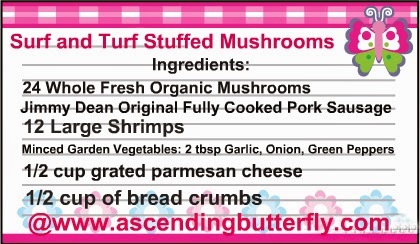 The meat adds loads of flavor and juiciness to each mushroom! I'm all for things that save me a step, the faster I get out of the kitchen, the more time I have to spend with my guests! Have You Tried Jimmy Dean Hearty Original Sausage Crumbles? Try out our recipe and let us know how you liked it! FTC Disclosure: Jimmy Dean provided us with Product Samples for editorial consideration. I am disclosing this in accordance with the Federal Trade Commission 16 CFR, Part 255 - Guides Concerning the use of endorsements and testimonials in advertising, you may check our Giveaway and Disclosure Page for additional information regarding Ascending Butterfly Disclosure. All opinions are 100% my own!